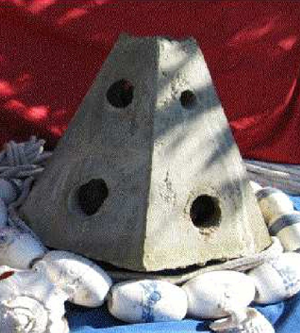 A unique option for placement of the deceased cremains is a reef ball which can facilitate the growth of marine life. The basic idea is that the deceased ashes are mixed with wet concrete and poured into a mold. This mold, weighing several hundred pounds, is specially designed to create a structure which will be placed on the ocean floor serve as a habitat for marine animals. These structures can take many shapes but their design enables them to remain stationary resisting the surge on the ocean floor. The reef balls may be embellished with shells, may include a plague for dedication. They greatly benefit the local ecosystem by providing a home for marine species and are especially beneficial in areas of over fishing or where the local echo system is in distress. We are aware of two organization in the Unites States that provide this service and we can work with either on your behalf. One is primarily on the west coast and the other on the east coast. The local company places the reef balls off the Los Coronado Islands which are in Mexican waters about 10 miles off the coast of San Diego. Each organization has several styles of reef structures with various pricing option to accommodate every budget. Family may often participate in the creation of the structure as well as view it when it is being placed in the ocean. having all family members on the yacht can be a very healing experience for all and greatly facilitates achieving closure with the departed passing. Since our sister company “Funerals Your Way” is a fully licensed home in California thus we will be able to assist you with any preplanning and cremation services which many required.